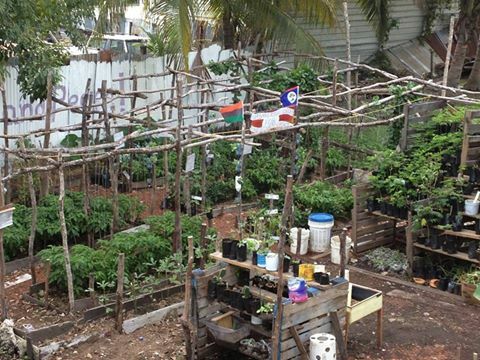 Tucked away on a long street in Belize City, lies the first Urban Garden in the country. Belize, for all its lush landscape, actually imports a disproportionate amount of fresh fruits and vegetables. Which makes The Urban Garden for Food Security and Peace, more than an urban garden, it is also a project which aims to empower residents to not just eat healthily, but also locally while becoming independent of costly imports. After visiting their garden, we interviewed the principal gardeners/activist to learn more. E.C. When was the garden founded, was it the motivation of residents, city officials? UGFSP As children we always had backyard gardens so gardening is not a new concept to some of us. 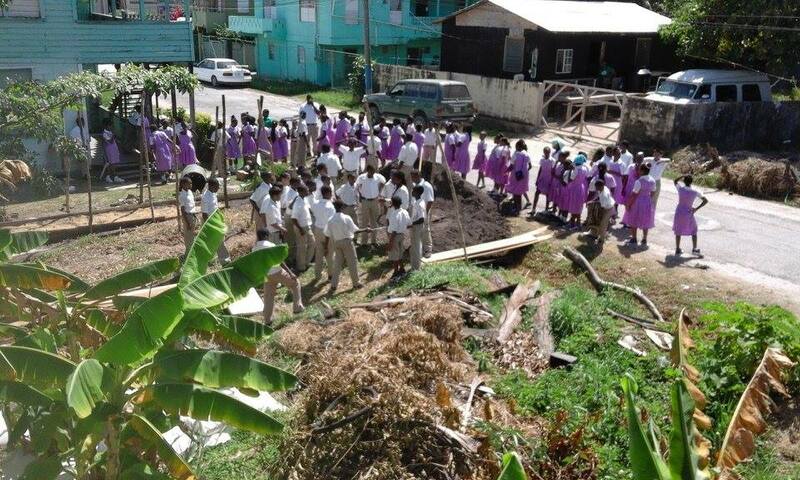 The Urban Garden for Food Security and Peace is a Belize Action Community project that seeks to grow both people and trees to mitigate poverty. This idea was extended to other organizations and individuals in 2006, when Belize began holding mutual improvement alliance meetings at Liberty Hall in Belize City. Many old and young people have participated so far and we continue to look for more organizations and people to step up to this task. 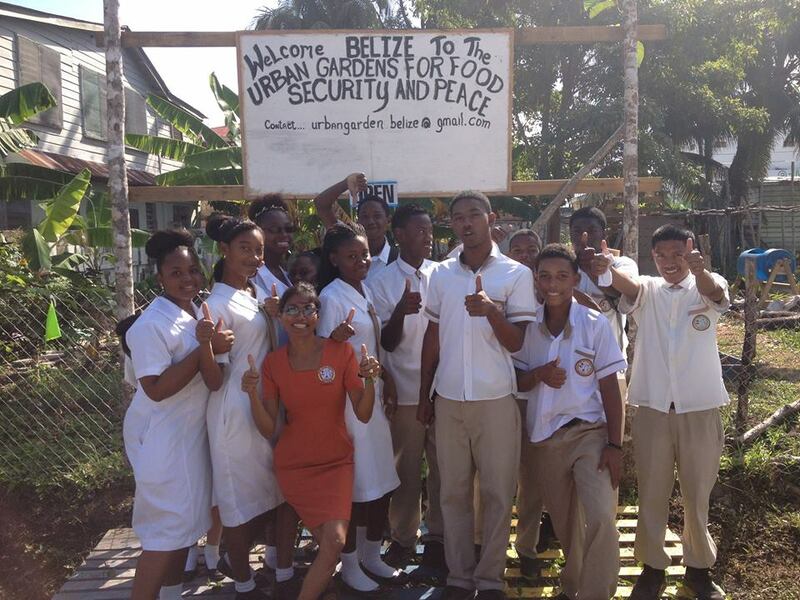 In 2015 after a youth summit, where we had young adult youth leaders from 5 Central American Countries, we found several passionate young Afro Belizean adults who wanted to be a part of a program that could positively influence their social, economic and environmental ambitions for themselves and Belize. At this particular time food security and peace is of vital importance. All over the world and in Belize we are experiencing many diseases at alarming rates because of the food we eat that is harming the human body. E.C. How did you come up with the name? UGFSP It was created by Louis E Guild of the Belize Action Community who has been involved with human and environmental development issues all his life. E.C. How many working members do you have and tell us a little bit about how you and others gave up paying jobs to be a part of this project? UGFSP The UGFSP is a vocation for ten people. I (Emerson Guild) have had no greater joy than volunteering for this UGFSP Project. Now our primary support comes from EmergentCorp, Belize Youth Department and The Ministry of Agriculture. These agencies along with others, continue to support the volunteers of the UGFSP. And yes there are four people, including myself, volunteering at the UGFSP who have given up paying jobs to be a part of this noble idea that continues to demonstrate self-reliance and team work. Sheryl Joseph I joined the Urban Garden for Food Security and Peace because my sister introduced me to the garden, I was very inspired the very first time I stepped in the garden…learning about our vegetables and fruits was such a simple but yet, eye opening change. I’ve felt liberated to share the little info that I’ve learned. The garden allowed me to do I always say to think right, you must eat right. Jamal Reid In August 2015, Emergent Corp facilitated the 11th CABO youth summit, held at UWI (University of West Indies) in Belize City. Two to three weeks later we decided to embark on Our Urban Garden for Food Security and Peace mission with Kadeem Bennett the founder of Belize Volunteers Club and Mr. Emerson Guild Manager/Director of Emergent, I realized that it was something that I liked to do plus I really do enjoy teaching other people that come to visit the work we have done, especially the children that visit us from the schools since it shows them something important & meaningful that they can be doing with their lives. Shenyl Joseph I gave up my paying job to be a part of the Urban Garden because I was tired of the call center and wanted something more, at the garden I see and feel creativity because I am creative. E.C. 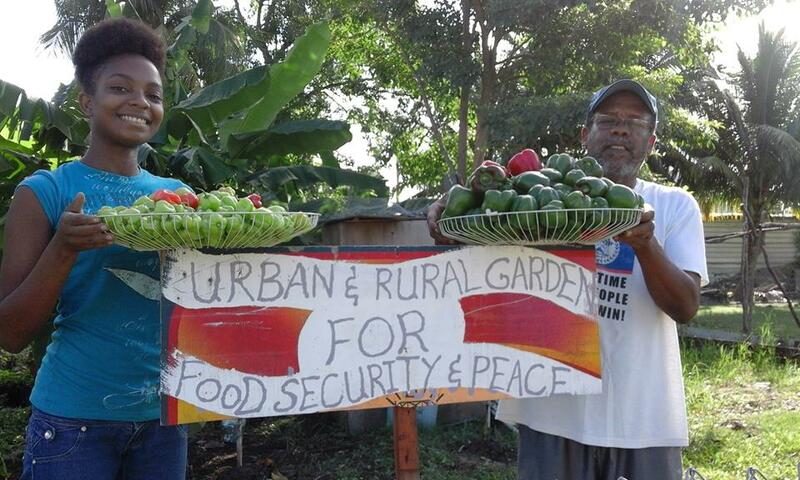 What is the underlying issue in Belize City with fresh food that this garden aims to resolve? UGFSP Creating food security and peace as a catalyst for environmental harmony in troubled communities. E.C. We noticed that you have a composting area, tell us about that. 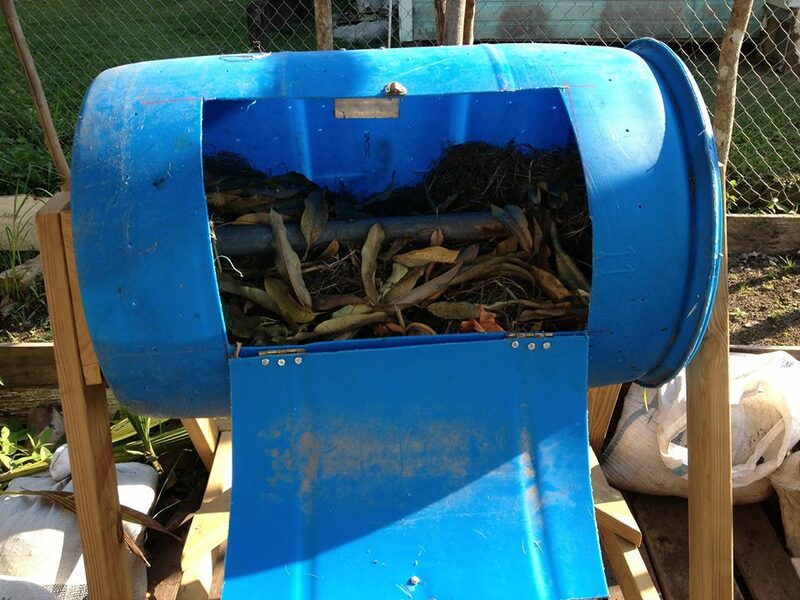 UGFSP We are composting and creating organic teas for fertilizer on our garden site with materials such as dry grass, fruit and vegetables peel, leaves, anything natural that can biodegrade and be used in a different way. E.C. What have been the key successes so far and what do you hope to improve? We have already harvested since the garden started Hot peppers, Bell/sweat peppers, and harvested almost every day is our Spinach, Callao and tomatoes. We have motivated a few people to start their own gardens. We have found different ways to do gardening with either vertical, raised beds or self-feeding boxes, using recycle materials such as empty plastic bottles etc. One of our members Kadeem Bennett visited Grenada to participate in an open forum about agriculture. Some of our members will get the chance to participate in a 2-week permaculture course which is a philosophy of working with, rather than against nature; of protracted and thoughtful observation rather than protracted and thoughtless labor; and of looking at plants and animals in all their functions, rather than treating any area as a single product system. We hope to improve in all aspects of us working together, whether it is in our personal development or in our everyday work at the Urban Garden, we’re definitely striving to improve in everything we do. E.C. What would you say is the most rewarding aspect? UGFSP The most rewarding aspect of is harvesting the food from the plants, you learn something new each day, working together in unity. E.C. How has the community responded? UGFSP We have and continue to receive invitations to visit schools and community centers to deliver our message and also many residents have visited our Urban Garden. E.C. What is the next step for your group, what is your biggest goal/aspiration? UGFSP Our goal at UGFSP is to create and explore good practices and examples for food security and peace. Our daily work activities may seem casual but are very scientific in nature and geared to the pursuit of “LIFE” the activity in harmony with nature.